This paleo recipe is an easy 4-ingredient delicious alterative to standard guacamole, yet everyone will rave that this is their new favorite! Tandoori guacamole does not have to be served at a specialized Indian feast. 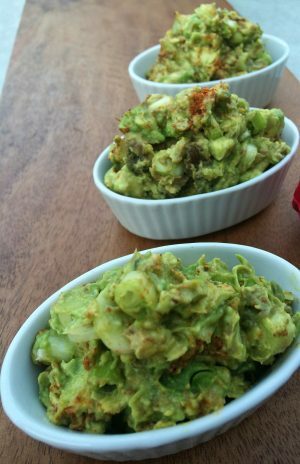 In fact, this guacamole is delicious on top of a grilled BBQ steak, or a burger or as a side to be dipped into with some kale chips or turnip fries. Really, the ideas during this summer season are truly limitless. When I surprised my family with this, the feedback was actually a bit surprising. I was told over and over this really was the best they had ever had. Wow! So what is the secret ingredient? I’ve used Spice Mode’s spices before and wanted to try one a different way; not having the spices so pungent. 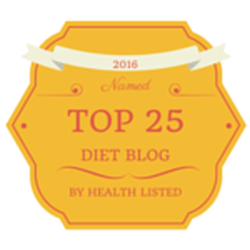 Hence I knew the fats in the avocado would do the trick. They did cut the “bite” down but at the same time the fats enhanced the spices beautifully. So simple to make and delightful to look at too! I hope you enjoy this; and definitely check out Spicemode and their amazing line of paleo products. Pretty incredible spices and I keep the sauces on hand at all times. In fact I use one of the sauces for my Roasted Indian Cauliflower. Delicious! In case you ever come across the terms tandoor versus tandoori I thought I’d better explain them now. A tandoor is a cylindrical clay oven that is used in the Middle East and in the Indian Subcontinent region to make flat bread or cooked meat. The word tandoori is the adjective of the word tandoor, meaning food that is cooked in the oven. Tandoori originally referred to cooking food by slow-roasting it in this clay oven. In the west, tandoori has come to mean a specific flavor rather than a method of cooking. For example, you can use Spicemode’s tandoori-style seasoning to make tandoori-style chicken or other poultry even if you do not have the oven. Many versions of tandoori mix are available online and you can make your own, but why do that when you can buy it. I just love Spicemode’s mixes and sauces! Enjoy, and if you have any questions at all just email me. Here’s a close-up of my delicious tandoori guacamole. 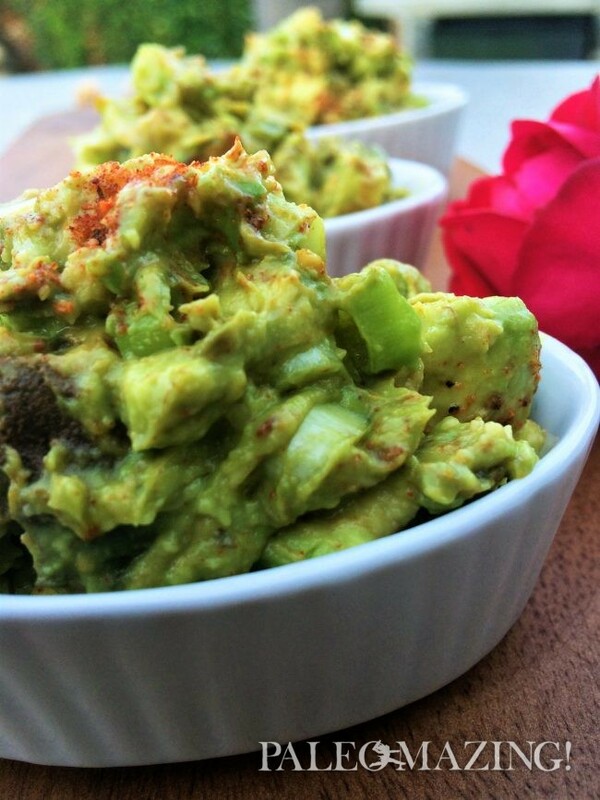 This paleo recipe is an easy 4-ingredient delicious alterative to standard guacamole, yet everyone will rave that this is their new favorite! Tandoori guacamole does not have to be served at a specialized Indian feast. In fact, this guacamole is delicious on top of a grilled BBQ steak, or a burger or as a side to be dipped into by some kale chips or turnip fries. Mash the avocados until semi-creamy, yet allowing some hunks.